Aircraft are flown at high altitudes for two reasons. First, an aircraft flown at high altitude consumes less fuel for a given airspeed than it does for the same speed at a lower altitude because the aircraft is more efficient at a high altitude. Second, bad weather and turbulence may be avoided by flying in relatively smooth air above the storms. Many modern aircraft are being designed to operate at high altitudes, taking advantage of that environment. In order to fly at higher altitudes, the aircraft must be pressurized or suitable supplemental oxygen must be provided for each occupant. It is important for pilots who fly these aircraft to be familiar with the basic operating principles. Figure 7-40. High performance airplane pressurization system. Figure 7-41. Standard atmospheric pressure chart. Pressurization of the aircraft cabin is necessary in order to protect occupants against hypoxia. Within a pressurized cabin, occupants can be transported comfortably and safely for long periods of time, particularly if the cabin altitude is maintained at 8,000 feet or below, where the use of oxygen equipment is not required. The flight crew in this type of aircraft must be aware of the danger of accidental loss of cabin pressure and be prepared to deal with such an emergency whenever it occurs. Differential pressure—the difference in pressure between the pressure acting on one side of a wall and the pressure acting on the other side of the wall. In aircraft air-conditioning and pressurizing systems, it is the difference between cabin pressure and atmospheric pressure. The cabin pressure control system provides cabin pressure regulation, pressure relief, vacuum relief, and the means for selecting the desired cabin altitude in the isobaric and differential range. 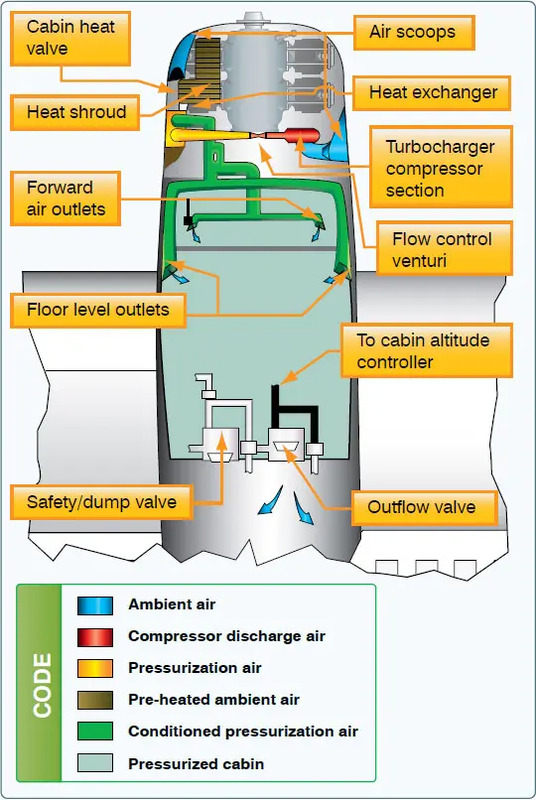 In addition, dumping of the cabin pressure is a function of the pressure control system. A cabin pressure regulator, an outflow valve, and a safety valve are used to accomplish these functions. The cabin pressure regulator controls cabin pressure to a selected value in the isobaric range and limits cabin pressure to a preset differential value in the differential range. When an aircraft reaches the altitude at which the difference between the pressure inside and outside the cabin is equal to the highest differential pressure for which the fuselage structure is designed, a further increase in aircraft altitude will result in a corresponding increase in cabin altitude. Differential control is used to prevent the maximum differential pressure, for which the fuselage was designed, from being exceeded. This differential pressure is determined by the structural strength of the cabin and often by the relationship of the cabin size to the probable areas of rupture, such as window areas and doors. The cabin air pressure safety valve is a combination pressure relief, vacuum relief, and dump valve. The pressure relief valve prevents cabin pressure from exceeding a predetermined differential pressure above ambient pressure. The vacuum relief prevents ambient pressure from exceeding cabin pressure by allowing external air to enter the cabin when ambient pressure exceeds cabin pressure. The flight deck control switch actuates the dump valve. When this switch is positioned to ram, a solenoid valve opens, causing the valve to dump cabin air into the atmosphere. 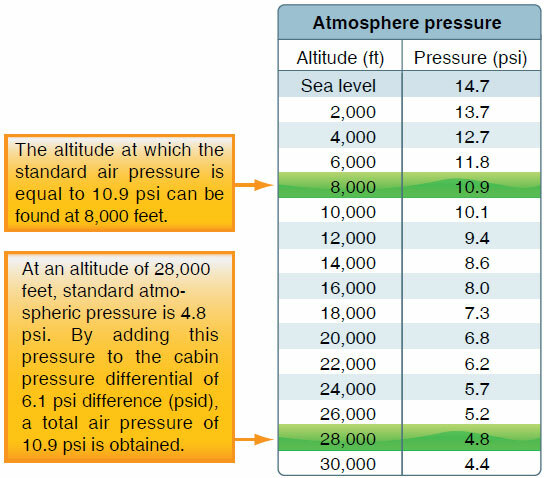 The degree of pressurization and the operating altitude of the aircraft are limited by several critical design factors. Primarily, the fuselage is designed to withstand a particular maximum cabin differential pressure. Several instruments are used in conjunction with the pressurization controller. The cabin differential pressure gauge indicates the difference between inside and outside pressure. This gauge should be monitored to assure that the cabin does not exceed the maximum allowable differential pressure. A cabin altimeter is also provided as a check on the performance of the system. In some cases, these two instruments are combined into one. A third instrument indicates the cabin rate of climb or descent. A cabin rate-of-climb instrument and a cabin altimeter are illustrated in Figure 7-42. Figure 7-42. Cabin pressurization instruments. Decompression is defined as the inability of the aircraft’s pressurization system to maintain its designed pressure differential. This can be caused by a malfunction in the pressurization system or structural damage to the aircraft. Explosive decompression—a change in cabin pressure faster than the lungs can decompress, possibly resulting in lung damage. Normally, the time required to release air from the lungs without restrictions, such as masks, is 0.2 seconds. Most authorities consider any decompression that occurs in less than 0.5 seconds to be explosive and potentially dangerous. Rapid decompression—a change in cabin pressure in which the lungs decompress faster than the cabin. During an explosive decompression, there may be noise, and one may feel dazed for a moment. The cabin air fills with fog, dust, or flying debris. Fog occurs due to the rapid drop in temperature and the change of relative humidity. Normally, the ears clear automatically. Air rushes from the mouth and nose due to the escape of air from the lungs and may be noticed by some individuals. Rapid decompression decreases the period of useful consciousness because oxygen in the lungs is exhaled rapidly, reducing pressure on the body. This decreases the partial pressure of oxygen in the blood and reduces the pilot’s effective performance time by one-third to one-fourth its normal time. For this reason, an oxygen mask should be worn when flying at very high altitudes (35,000 feet or higher). It is recommended that the crewmembers select the 100 percent oxygen setting on the oxygen regulator at high altitude if the aircraft is equipped with a demand or pressure demand oxygen system. The primary danger of decompression is hypoxia. Quick, proper utilization of oxygen equipment is necessary to avoid unconsciousness. Another potential danger that pilots, crew, and passengers face during high altitude decompressions is evolved gas decompression sickness. This occurs when the pressure on the body drops sufficiently, nitrogen comes out of solution, and forms bubbles inside the person that can have adverse effects on some body tissues. Decompression caused by structural damage to the aircraft presents another type of danger to pilots, crew, and passengers––being tossed or blown out of the aircraft if they are located near openings. Individuals near openings should wear safety harnesses or seatbelts at all times when the aircraft is pressurized and they are seated. Structural damage also has the potential to expose them to wind blasts and extremely cold temperatures. Rapid descent from altitude is necessary in order to minimize these problems. Automatic visual and aural warning systems are included in the equipment of all pressurized aircraft.